I need to create a complex matrix check box, like the one in the image but I couldn't find a way to merge cell in the matrix and/or leave empty cells.. How can I do a table like this? 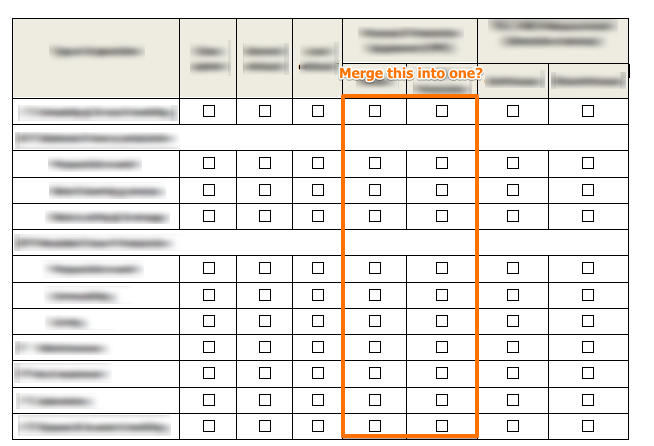 Just to clarify you wanted to merge the fields into one like the one in my sample image? I think you can hide and unhide this using CSS. Kindly clarify what you are trying to accomplish. We'll wait for your response. Hi, thansk for you fast answer. No, I want to marge de cell to get the result displayed. This way I can have two sub-categories under the same "double column" - for example the two collumns from the righ are under the same categorie.. The two horizontal lines on red are also merged cells without checkboxes.. I'm using matrix tool to do this in jotForm. As you can see there is a main label or category that I labeled as "This is just a simple test". You can also see that there is a row without checkboxes. All that can be done with CSS codes. If you wish we can elaborate the code for your Matrix table so that you accomplish the desired scenario. All you need to do is to create your matrix table, but just add the headers or "sub-categories", then share here with us the Main categories where they should be placed. That way we will position them in the correct place using CSS code. And, of course, kindly share with us the URL of your form where you have your Matrix table.